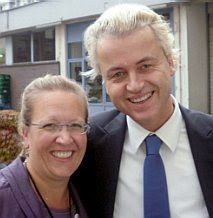 For the last few weeks we’ve been focusing on the trial of Geert Wilders in Amsterdam. Mr. Wilders, as you all know by now, has been charged with “hate speech” for speaking the truth about Islam. It’s important to remember that Geert Wilders is not the only European citizen being persecuted for publicly criticizing Islam. Regular readers are aware of the case of Elisabeth Sabaditsch-Wolff, who is being charged with “hate speech” in her native Austria for her seminars on the danger of Islam. Elisabeth was first notified of the possible case against her last December. For almost a year she has been waiting for a formal charge and a court date, and now the other shoe has finally dropped: she will go to court on November 23, 2010. Today I have officially been informed that I will have to stand trial on November 23. I have received the official charges, which are a sort of pick-and-choose of whatever I said during the first two (out of three) seminars. One paragraph consists of words that I never said, but rather those of one of the participants. But I am accused of having said them (they contain the damning words “Adolf Hitler”). Here is a sample of my evil words: “We need public awareness of the danger posed by Islam. Education needs to be state of the art, eg biology. History. Students need to be taught facts. There was a Turkish siege [in 1683], and they were badly beaten. That must remain [in the history books]. No tolerance for the glorification of violence! And that means we have to get rid of most of the Quran. We must realize that the Muslim Brotherhood is a Trojan horse. Turkey is part of that. This is what I’m being tried for. This is what cannot be said aloud in Austria today. Now is the time to contribute to the defense fund for Elisabeth Sabaditsch-Wolff. Visit the website In Defense of Free Speech and look for the “Spenden” button at the top right. Any contribution you make will be deposited in a trust account, and all money donated to it goes to her legal fees. It is not under Elisabeth’s control, and if any money is left over after the end of the court proceedings, it will used for the benefit of the Citizens’ Movement Pax Europa, a non-profit human rights and anti-Islamization group in Germany. Dymphna and I have just made our first contribution to the ESW defense fund. As of this writing, the donation page is in German, although some of the instructions are translated in pop-up captions when you point your mouse at them. Important: Because this is a European page, it expects a comma (,) rather than a decimal point (.) to separate the whole number from the fraction. We ran into an error because of this, and it stymied us until we figured it out. There will eventually be an English-language version of the donation page, but for the time being keep the above information in mind when you donate to the Elisabeth Sabaditsch-Wolff defense fund. As we say in the UK; the truth will out............... Keep up the good work............ We also say: Don't let the bastards get you down. The Metropolitan Police: Guardian Angels? A Follow-Up Demo In Rotterdam? Stand Up and Show Your Faces! A Bit More Media Attention? CAIR: A Foreign Influence on NPR? Oskar Freysinger: Is Islam a Threat? Is the Truth Illegal in Austria?